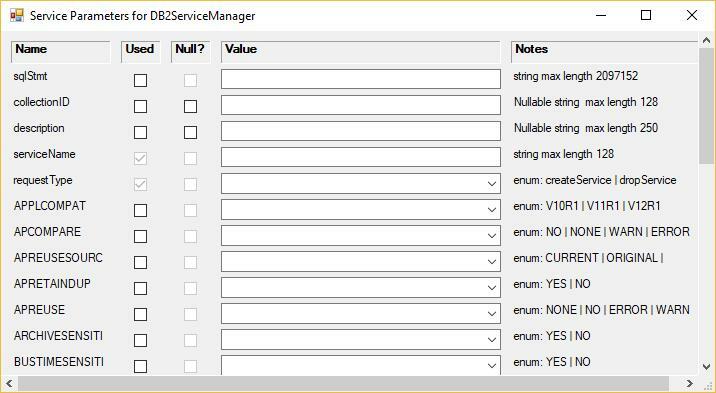 Whilst working with the DB2 for z/OS REST API, I thought it would be useful to have a tool to make things easier to see what was defined, what the parameter profiles look like and maybe even be able to run the services. Feel free to use the application and its source code in any way you want, but please remember that it is at your own risk. 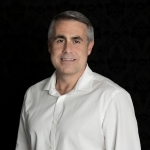 The application was built with Microsoft Visual Studio Express 2013 for Desktop. This is one of the free versions of Visual Studio published by Microsoft and includes all of the features that a large mainframe sysprog dinosaur might want for writing some VB code. Except the Setup and Deployments project templates. So installation is a bit more “copy and run” than Microsoft Installer packages. Pull down list of connections that you’ve already defined (initially empty). It pre-selects the last session that you were connected to. 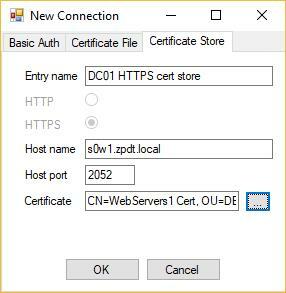 “Host name” and “Host port” are the TCP/IP name / ip address and port for your DB2 service. 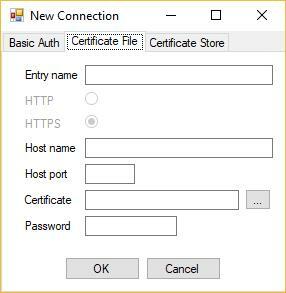 Certificate Store is used for a connection authenticated by a PKCS12 certificate in the Windows current user local certificate store. 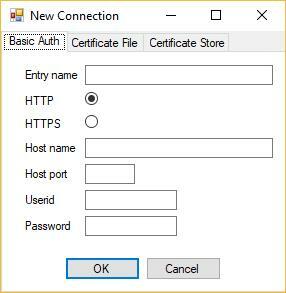 Basic Auth, then HTTP or HTTPS can be selected, and the mainframe userid and password need to be supplied. These are saved in the local user part of the registry. 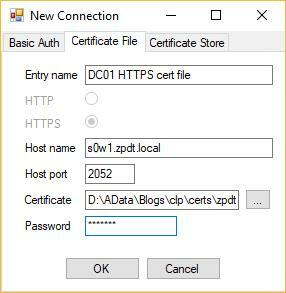 The “…” button displays the file picker dialogue to aid in locating the certificate file. Double-clicking an entry selects it for use, and the subject is retained for fast lookup. 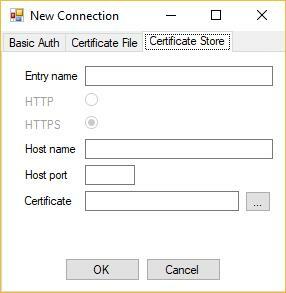 Note that if you want to verify what certificates are currently installed on your machine for your user, you will need to use the Microsoft Management Console (Start->Run->mmc) and add the Certificate snap-in (File->Add/Remove snap-in->Certificates – for “My user”), then look in the Personal -> Certificates folder. Note that the first two services in the example are the IBM DB2 supplied ones. The services are listed by collection id and then name. By double-clicking a service in the list, you are shown a panel with the details where available. 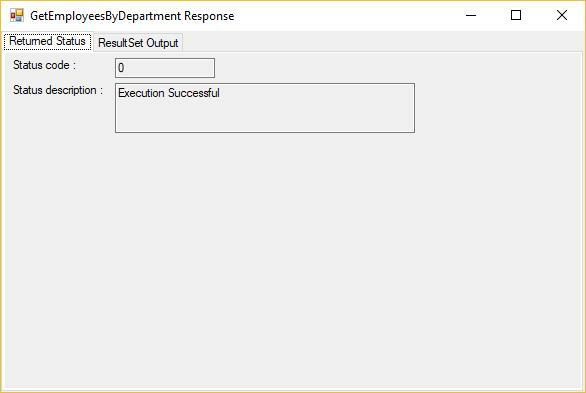 Note that some result sets (SELECT) are itemised in the ResultSet Output, dynamic result sets (stored procedures) are not. 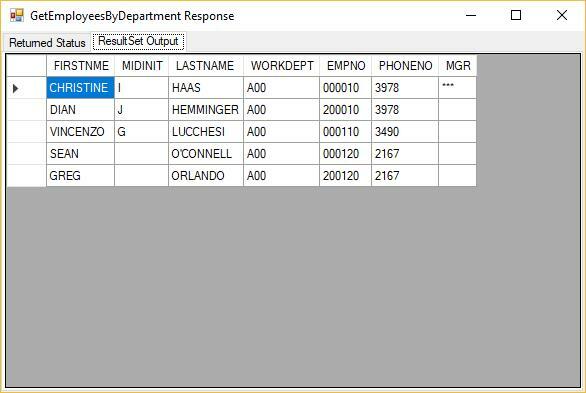 We can see the two input parameters (dept and mgr) and the output result set fields and variables (StatusCode and StatusDescription). 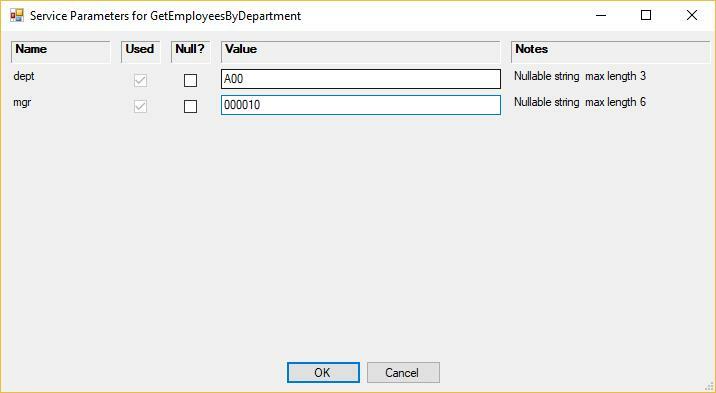 “Used” indicates if the parameter should be used. Note that this defaults to false except where parameters are required, where it is true. 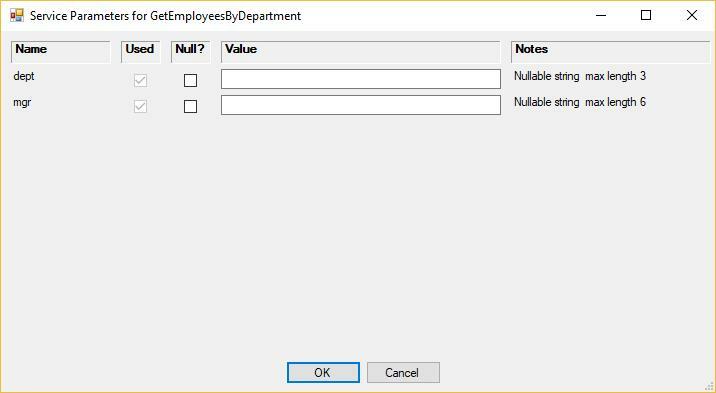 “Null” allows nullable fields to be null. 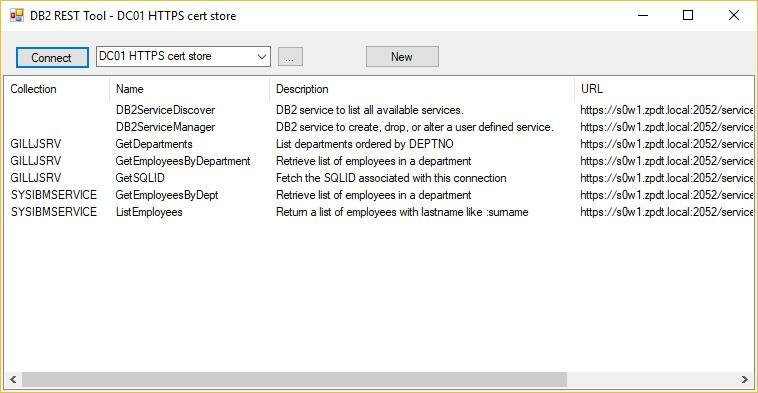 Note that the New service button uses this Run method against the DB2ServiceManager service. 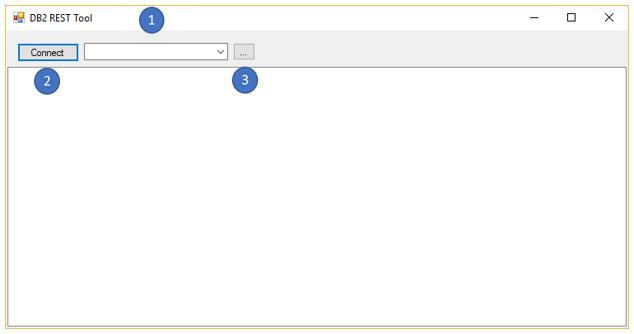 This interface with all of the optional parameters is a little fiddly and it is easy to select a pull-down value and forget to tick the used box. Once you’ve set all of your parameters, scroll to the bottom of the list and click OK or just press Enter. 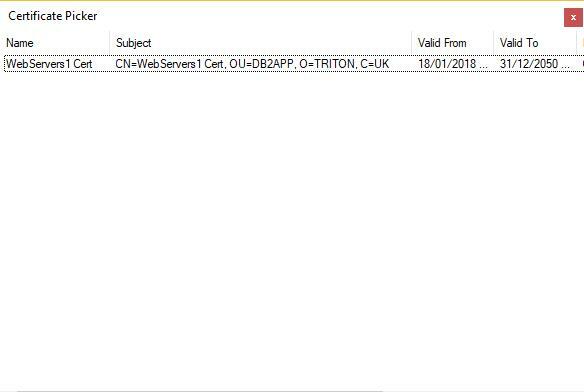 A confirmation is shown and if OK is selected the service is dropped. 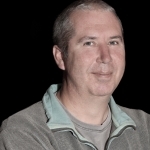 I hope you find this useful, and if anyone has any comments or feedback, please feel free to post a reply to the blog. 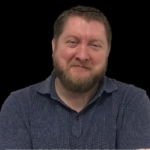 It would be kind if you remember that I’m a mainframe sysprog, though, rather than an interface designer – although that’s probably obvious! 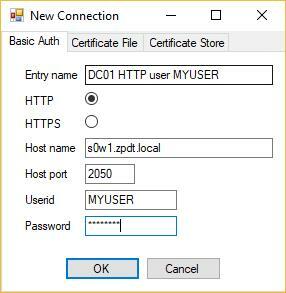 James, I was able to solve this problem by doing a search in the Microsoft registery for wDB2REST and deleting the Triton register entry in HKEY_CURRENT_USER. After that I was able to start the tool again.